Welcome to White Peaks Villa , built over three levels with 5 bedrooms and 3 bathrooms it comfortably accomodates 12 guests. This new home has beautiful lake and mountain views and a large outdoor deck from which to enjoy them. Family friendly with a grassed area , table tennis, foosball table, Play Station 3 and other games provided for kids - big and small. Free unlimited hi speed wifi and sky / cable tv. This home has a luxury fitout with underfloor heating in all the bathrooms, electric blankets and all the facilities you could possibly need. Each room has a radiator heater and there is a large wood fire in the lounge room. Outdoor gas heater for sitting outside on the deck and a large barbecue is available for use. 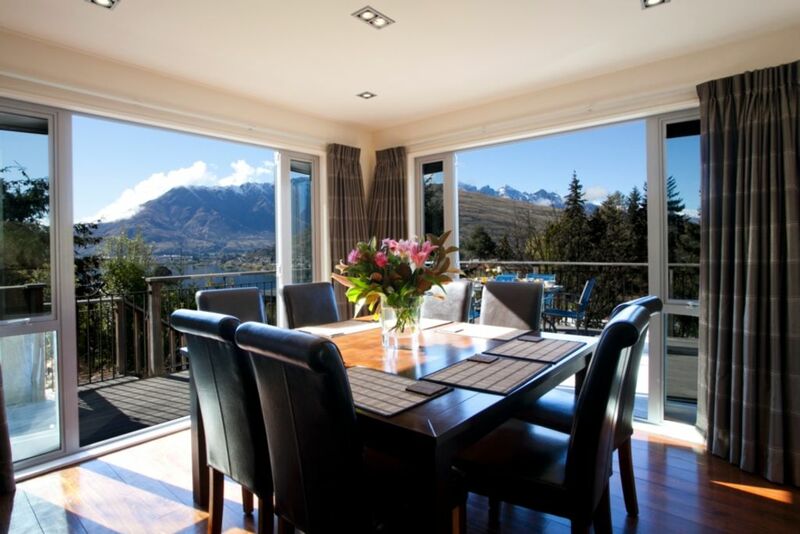 Quite convenient location very short 3 - 5 drive to either Town or Queenstown's main shopping centre. Shuttle bus short walk from house. White Peaks Villa also accomodates for toddlers with a Portacot , high chair and safety gates supplied at no extra charge. Very much enjoyed our stay - being a large group it was perfect and never felt like we were on top of each other. Great house , great location , very clean! Thanks Sally for taking the time to post a great review ....so very happy to hear you enjoyed your stay. Hope you can return soon!. House was extremely clean and tidy - and OH the fire place !!!! just awesome !! Great house for large groups/families. Great house for large groups/families. Wonderful views. Comfy and roomy!